Lost Egyptian City Found Under the Sea After 1,200 Years! 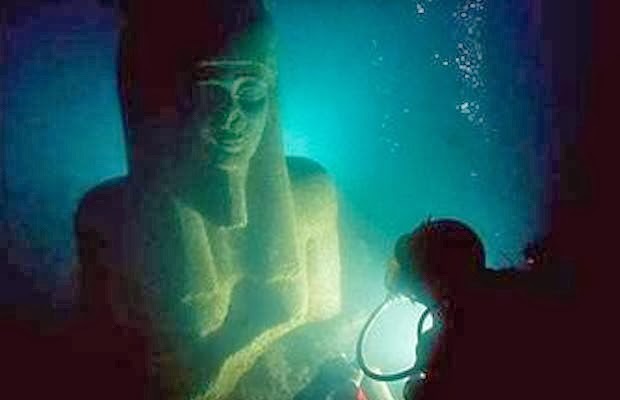 Amazing discovery of an Ancient Egyptian City – Heracleion which for centuries was thought to be a legend – a city of extraordinary wealth mentioned by Herodotus, visited by Helen of Troy and Paris, but apparently buried under the sea. It is believed Heracleion served as the obligatory port of entry to Egypt for all ships coming from the Greek world. The city, also called Thonis (by the Greeks), vanished from the earth about years ago, and is now found. The city is located within an overall research area of 11 x 15 kilometres in the western part of today’s Aboukir Bay, Egypt. It was only a legend. Appearing in a few rare inscriptions and ancient texts the city of Thonis-Heracleion was not something anyone expected to find, and no one was looking for it. So it was something of a shock when French archaeologist Franck Goddio, looking for 18th-century French warships, saw a colossal face emerge from the watery shadows. Goddio had stumbled upon Thonis-Heracleion completely submerged 6.5 kilometers off Alexandria's coastline. Among the underwater ruins were 64 ships, 700 anchors, a treasure trove of gold coins, weights made from bronze and gold, statues standing at 16 feet, and most notably the remains of a massive temple to the god Amun-Gereb, and the tiny sarcophagi for the animals that were brought there as offerings. The ruins and artifacts made from granite and diorite are remarkably preserved, and give a glimpse into what was, 2300 years ago, one of the great port cities of the world. The harbor of Thonis-Heracleion (the Egyptian and Greek names of the city) controlled all the trade into Egypt. Slabs of stone inscribed in both ancient Greek and ancient Egyptian were found as well. Dozens of small limestone sarcophagi believed to have once contained mummified animals. Built around its grand temple, the city was criss-crossed with a network of canals, a kind of ancient Egyptian Venice, and its islands were home to small sanctuaries and homes. Once a grand city, today its history is largely obscured and no one is quite sure how it ended up entirely underwater.